In the ancient times all stories used to come only through travel. Travel brought about the mysterious faraway land closer through stories to the common man who did not travel and spent there entire life in one village. These stories offer glimpse of achieving higher values like honesty, compassion, beauty to the aspiring person listening. Today with modern technology, traveling has become easy. Everyone travels and the mystery is removed especially with the advent of television. Yet for those with the gypsy mind, it is foot travel in lesser frequented terrain that brings in possibility of mystery, adventure and legends closer. By experience of hiking or trek, the legend that speaks of a past with heroes, several mountain and wonderful panorama are automatically evoked. It is not uncommon for trekkers to get animated while narrating his experience of a trek. This is especially so, when the experience is uncommon to the modern era. I narrate herewith one such experience that happened to me. “Once upon a time…” I could not resist it. The ancient way of telling a story always began with these words & they still evoke that rich sparkle & mystery of a wonderful story. However, here goes my story. While in college, Myself & my friend made an impromptu decision to trek to Peth on the coming Saturday. The two of us fixed the time after lunch to start our journey. 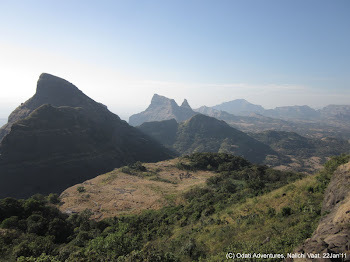 Our route planned was train to Karjat and bus to base point. We reached Karjat at 4 pm. At the bus stand we were told that the bus to the base village near Peth was at 7 pm only. Groan! That meant we had 3 hours to kill. We brainstormed and decided that we will go through any other bus to closest possible point and then re-plan from that point onwards (we were hoping to get a lift from that point onwards) This saw us reach 8-10 kms before the base point by 6.00 pm We had a quick breakfast and took the trial to peth. As we started walking we saw to our dismay that no vehicles were plying along this inside road of 7 kms. However, we were young and confident. It was mutually decided that we will walk the 8 kms and sleep for the night at the base village and start trek early morning at 6 AM. As we continued walking along the road it started getting darker & darker. Soon our torches were out (there were no streetlight in those days along the village road) In the dark, our mind did play some tricks as we were also facing our fear of the dark. About 2 hours of walk later, we could see the lights of a reasonably sized village. We sought to enquire in the village about the distance left and time required to walk it out. To our amazement, this innocent question that was asked in hindi by us (we were both south Indians), found several curious villagers asking us in marathi about how we got to reach their village. Suddenly we felt like 2 aliens landing from the mars to planet earth for all the curious stares and questions that was being thrown our way. Shortly we found ourselves sitting on the porch of the village Sarpanch (headman) while tea was being made for us (No charge for we were guests!). One lady amongst the villagers gathered around remarked in local dialect(marathi) that “Amhi pun evda laamb chalet nahi” (Even we do not walk this long) she continued talking. The overall content added up to meaning that they were of opinion that Mumbai (city) people were lazy and now we had put them to shame by this long walk All this adulation made us feel great and important as if we had climbed mount everest! This still did not end. Just when the tea was ready, the bus from Karjat reached this village (that started at 7pm) One villager made the bus halt for us while other villagers asked us not to rush and drink tea peacefully. As per them we had walked enough and that the bus will ensure that we reach the base village without any further walking. Before we entered the bus another villager, went ahead and instructed to the 1st villager inside the bus(who was a resident of base village) “bega, heyy amche pahune aahe, tyacha khatirdari kara”(these are our guests, ensure they are taken care of!) It was such a heady experience when that local resident villager made us sleep in his house for the night despite our protest that we were ready to sleep in the temple. It was one awesome experience and adventure. This was 15 years back in my life. Even now, I retain my love & fond memory for the rustic hospitality and love showered by the villagers that makes me look forward for more rustic outings. I am sure that other trekkers must have had similar experiences to share! Also in such places if you seek, villagers will eagerly narrate an eerie ghost story that occurred in their village.